The Explore the Seafloor team continues to be busy over this summer period. We spent the last two weeks interacting with all the friendly people in the Norfolk area. We took our display to the Lowestoft airshow and provided shelter and entertainment to some rain soaked visitors. Despite thunder and lightning the mood at the show was enthusiastic and the rain didn’t stop people from enjoying our seafloor display and the amazing aircraft acrobatics. Following a quick pack up the roadshow moved to the lovely environs of the Great Yarmouth Sea Life Centre education room. We felt very at home surround by the colourful fish and murals. Visitors displayed an interest in the archaeological finds and were excited that many artefacts were originally found near Great Yarmouth. Our weaver fish however, stole the show bringing back people’s memories of how it feels to get up close and personal with a live one – ouch! Visit our facebook page to view the latest pictures. Print article This entry was posted by Rhonda Steel on September 1, 2010 at 9:57 am, and is filed under news, Roadshows. Follow any responses to this post through RSS 2.0. You can leave a response or trackback from your own site. 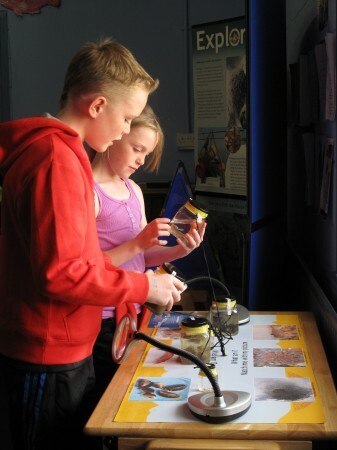 Explore the Seafloor is now at the Great Yarmouth Sea Life centre located on the main sea front. We are having a great time and glad to see the sun finally shining. Come on down and join us for lots of fun hands- on activities and discover what you can find on the seafloor.